Summer is gone, we are enjoying autumn days and heading to winter now. In many regions, this cold season brings snow, low temperatures, and plenty of harsh winds. You’ll need to take some extra steps this fall to ensure your livestock make it through winter in good condition. 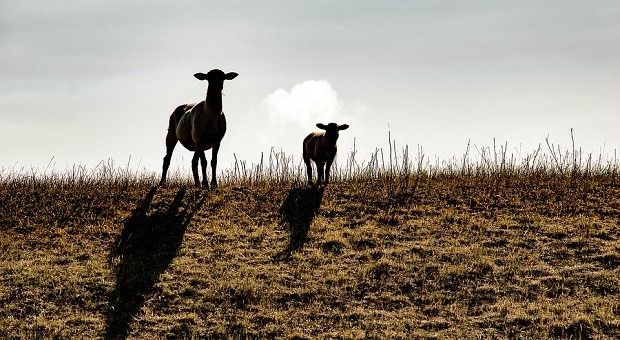 Water, food, shelter and safety are essential for your livestock. Focus on these requirements and follow the next steps to prepare your livestock for the coming winter. Waterers are available in a variety of sizes with electrical heating elements built in. For large stock tanks, you can find electrical heaters in a cage that floats in the water. Your local feed store should have all of these available. The purpose of the electrical heater is to keep your animals’ water from freezing. The electrical part stays just warm enough that the water stays liquid. These are the easiest way of ensuring your animals have plenty of water all winter long. The downside is that you have to have electricity available where you water, which isn’t always feasible. There are propane stock tanks available, which might be your best solution for large livestock. If you’re around the farm during the day, make it a point to check on your animals more frequently. Since I don’t have electricity out by my rabbit pens, I water them three times a day instead of only twice. That extra watering keeps them in water for the bulk of the day. When the weather is extremely cold, I only fill their water halfway during each watering. This usually keeps it from getting filled completely with ice. I still have to bring out hot water once a day to take care of the ice, but it’s easier than doing it every time. My first winter with rabbits I made the mistake of trying to use water bottle type waterers. The water froze completely on the straw portion which meant even after I’d filled the waterer, the rabbits couldn’t drink it. I quickly realized my mistake and switched to bowl style waterers. Be sure to check any special water tanks you have for your critters to ensure they are working in the winter. If your animals have a shed to take shelter in, you may be able to move the waterers in there. Then you can run a propane or electric heater to keep the water from freezing. The roof and sides of your shed will protect your heater. If I lose power, I lose water too. The electric pump at the well house can’t run. Since we normally lose power for several days each winter, a backup water source is essential. Thankfully there’s a creek running through my farm. My husband and I have broken ice and hauled water 5 gallons at a time several times to water livestock. If you don’t have a creek or pond nearby, you’ll need to think through another water source. Do you have enough water stored that you can water your animals during a power outage? Do you have a large enough tank that they can go without a fill-up for a couple of days? Watering in the summer is simple enough. You hook up a hose and run it to the tanks to fill. But when the cold weather hits, you have to take extra precautions with your hoses. That way they’re available for watering each day and not frozen solid. In the winter, I run my hose through the barn instead of around the outside. Though it means I need a little extra hose, I’m able to drain it and store it in a room with a small heater. It’s just enough to keep it from freezing. Usually. Sometimes it gets colder than I anticipated, and the heater can’t keep up in the uninsulated barn. When that happens, I haul the hose into the house and let it thaw behind the wood stove. It’s also a good idea to keep a backup hose on hand. Perhaps you can store an extra in an outbuilding or in your basement. That way you always have a hose ready when your animals need a drink. Here is an interesting project on how to keep your livestock’s water from freezing. Video first seen on WELSBY ROOTS. Animals need plenty of feed to stay warm in the winter. Stockpiling feed in the fall will ensure you won’t run out midwinter if a large storm keeps you away from the store. If you’re feeding large animals hay, you’ll want to store at least a ton per head. Depending on your location and the length of your winter, you may need more. I don’t like having to track down hay in the winter because it’s typically more expensive and a pain to go get. I usually store enough hay to get me from September to May because by May, even in a bad year, the pasture is ready. You know what your winters are like, so do some basic calculations and figure out how much of a supply you’ll need to build. If you’re feeding grains or other concentrates, you’ll need to keep it stored in rodent-proof containers. Keep a close eye on your animal’s condition over the winter. Most animals will lose some weight over the winter, which isn’t anything to be concerned about. 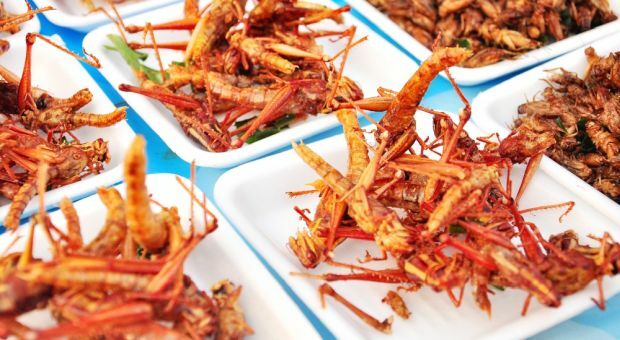 However, you don’t want them to get too thin. If you start noticing ribs sticking out, it’s time to increase their rations a bit. If your animals are used to eating fresh pasture, be sure to start their transition to winter feed a couple of weeks early. That way they can eat both and slowly get used to what they’ll be eating. To avoid dealing with feeding and watering in the dark, my winter chore schedule is different than the rest of the year. I feed later in the morning, and earlier in the afternoon. If you’ll be adjusting feed times this winter, be sure you give your animals a chance to get used to the new schedule. I tend to start moving the time up in early fall, and then adjust by a half an hour or so each week. That way the animals aren’t startled by an entirely different schedule out of the blue. Chickens need a certain amount of light each day in order to keep laying eggs. If you want your chickens to lay all year, you’ll need to provide them with some sort of artificial light. I have a light plugged into a timer in the coop. It turns on early each morning and automatically shuts off around 9 AM. By that time the birds are all out of the coop and frolicking in the barn or around the yard. Be careful having your light turn on in the late afternoon. If your chickens don’t realize it’s night, they won’t hop up on their roosts for the night. Then the light will shut off suddenly, and they’ll have to stumble in the dark to get where they need to be. Some animals need some extra heat to make it through the winter. 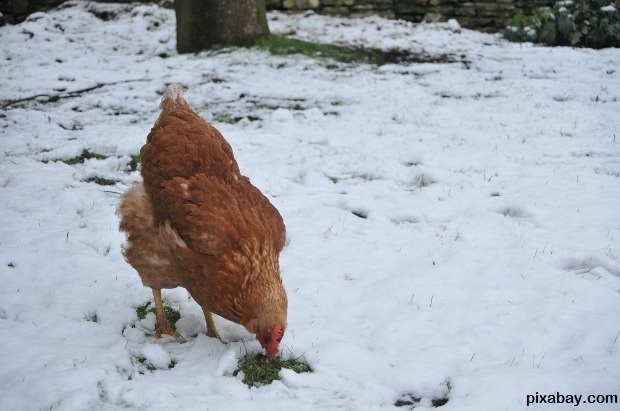 For instance, some of my chickens don’t handle the cold as well as some of the others. To help provide a bit of extra heat, I have a red heat lamp plugged into the coop. It’s on a sensor that turns on when the temperature drops below freezing. When the temperatures warm back up to 38 degrees, it shuts off. It’s not a lot of heat, but it’s just enough to keep the coop warm. Keeping it on a sensor means I don’t need to keep turning the lamp on and off manually. It definitely cuts some work out of the winter chores. The red lamp provides heat, without bugging the chickens by turning on and off in the middle of the night. A yellow heat lamp provides the same problems that a regular light does when it shuts off suddenly. Your animals need a place to go to get out of the wind. It gives them a place to bunker down on a cold winter night. You’ll want your shelter to have a roof and a couple of sides at least. You can use tarps to create sides if necessary, but make sure you do this in the fall. Otherwise you’ll be outside in the cold yourself trying to wrestle a tarp in the wind. It’s much easier if you do it before winter! 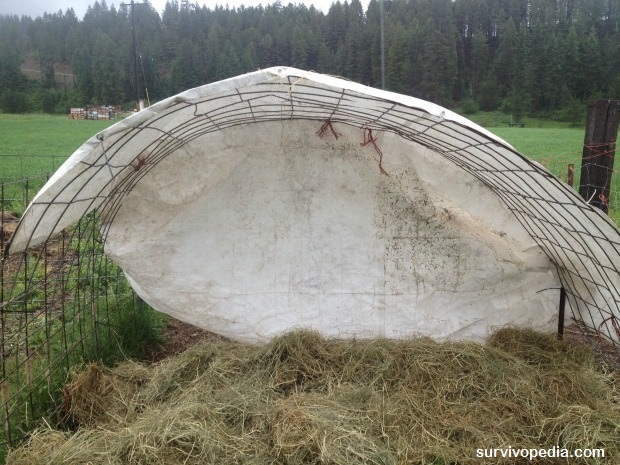 Tarps around rabbit pens helps keep the wind from blowing right through the wire sides. You can also secure tarps to wire cattle panels to create temporary shelters, like this one. A good layer of bedding inside your shelter keeps your animals warm. I typically use straw or old hay as bedding. The carbon from this material will also help reduce odor from cooped up animals. I employ the deep layer method of bedding for my chickens. I clean out the chicken coop each spring, and get all the old bedding out. Then I slowly start adding straw as necessary to cover up poop. By the time winter comes around, they have a fairly deep layer, as you can see in the picture below. As the lower layers of poop and straw slowly break down, it releases a little bit of heat. This helps keep the birds from freezing. I’ve started using the same deep layer method with the cows. They get a little bit of fresh bedding each day, covering up the poop piles. Then in the spring the tractor cleans it all out. I ensure my rabbits have plenty of straw to burrow in to stay warm. My pens have a portion with a solid bottom, which is where I put the straw. If your pens have a wire bottom, you can use a piece of a cardboard box to hold straw in for them. A good layer of bedding will keep your animals warm. Be sure to check it frequently and replace as needed. When you’re looking at the shelters for your animals, you need to keep ventilation in mind. 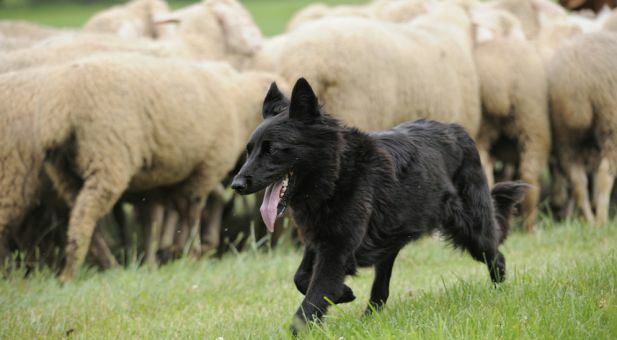 When animals are cooped up without proper air flow, sickness can spread quickly. 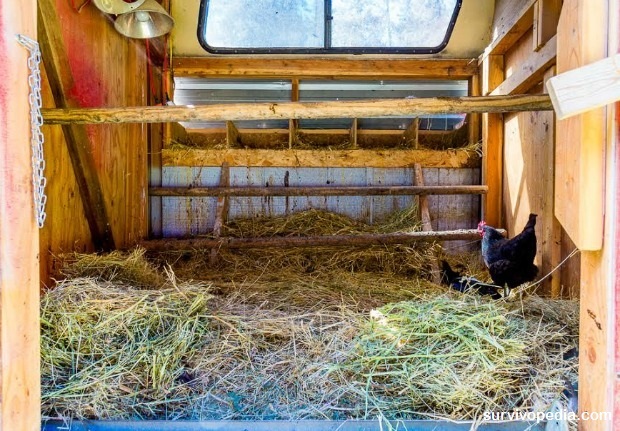 You’ll want to ensure air flows well through your chicken coop. If you have windows, leave them open just a little bit throughout the winter to get the air moving. 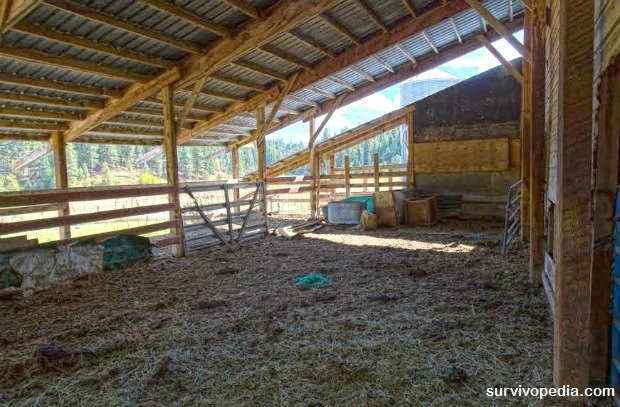 Cattle, sheep, and other large livestock benefit from a shelter that isn’t completely closed in. Here’s a picture of the large pen where most of our cattle spend most of the winter. You’ll notice that it’s partially open to the elements. This open side allows the air to get in, and helps prevent illness. The closed side provides the much needed windbreak, and keeps the cows warm. 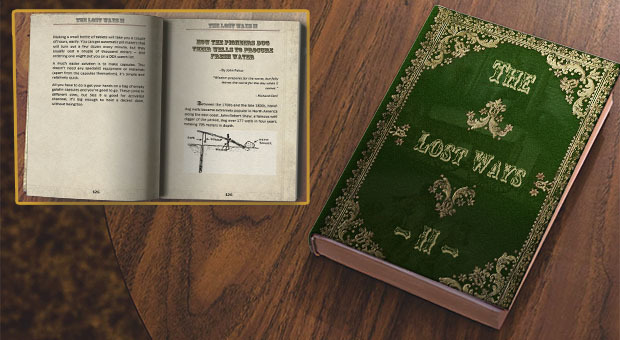 There are a lot of homesteading and survival secrets you can learn from our descendants. Click the banner bellow to find out more about them! Are Your Animals Ready for Winter? Are your critters ready for whatever winter brings? Did I forget anything about preparing? Please share what steps you take to get your livestock ready in the comments section below.